Portaferry runner Ciara Mageean is set for a return to the championship arena after qualifying for next month's European Indoors in Prague. The Northern Ireland woman, 22, ran a huge 3,000m indoor personal best as she clocked 8:55.09 to finish seventh at the Millrose Games in New York. Her time was 16 seconds faster than her previous best for the event set in Athlone in December. Mageean returned to action last July after an injury lay-off of two years. Kenyan Sally Kipyego won the race in 8:41.72 while those ahead of the Irishwoman included Britain's European Cross Country silver medallist Kate Avery who took sixth. Mageean will compete at next weekend's Irish Indoor Championships in Athlone. 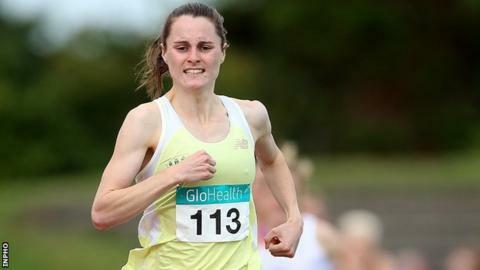 Her rivals in Athlone could include Sara Treacy who won the British Indoor 3,000m title in Sheffield over the weekend. Treacy took the title in a personal best of 9:06.23 although her winning time was outside the European Indoor qualifying mark. Maria McCambridge placed fifth in 9:14.99 with Kerry O'Flaherty seventh in 9:19.51. City of Lisburn's Amy Foster was seventh in the 60m final in 7.54 with her fellow Commonwealth Games competitor Paul Pollock finishing eighth in the men's 3,000m final in 8:13.53.